Now a days Facebook ads are becoming very popular and effective. You can see the number of ads on Facebook is increasing greatly. In other words you can get a lot of money from your product if you advertise it on Facebook. Facebook is a great platform to get something into people's knowledge. Facebook ads are less expensive than the other advertising ways and they can also get you a lot of traffic. Login to Facebook and go to Facebook Ads Home Page. You can also get this link by going at the bottom of any Facebook page and then clicking a link named "Advertising". Now the second step is to click the link "Create an Ad". This will lead you to the design phase. Now you have entered the design phase and the first thing is to choose a destination. Here you can give a link to your page. It can be a Facebook page or any other page. Here I am focusing on Facebook Page. Facebook users interact with a brand or a company on their official Facebook page. When they like the page, this activity is captured. Page like: When someone likes your page, this story appears in the news feed of his friends. Page Post: When you post something on your page your fans are notified about it. Page Post and like: The combination of number 1 and 2 forms this type. It is a form of Facebook advertising where you can give the viewers a message. The likes of the friends of Facebook users also appear on it. Now you have to select the destination tab. You can select the tab of your page where you want to send the viewer when he clicks on your ad. The title of the Facebook ad is always the name of your Facebook Page. Step 5 is to add an image in your ad to make the ad more attractive. You can select the profile picture of your page if it is attractive enough. Now you have created the ad and the next step is to target the audience. You can select the audience of your ad. You have the otion of selecting the audience of any country or city. You can also target the people of your area only. You can also select age and gender. This means that your ad will be visible to only those people who lie in the age range you selected and who have the same gender your selected. Facebook targets the people according to their interest. When they like something on Facebook or somewhere else their activity is recorded and then they are presented with the ads in which they are interested. Bluehost Vs HostGator: Who Wins? People who haven't liked your page. You are given a choice to present the ad to only those people who's friends have liked your page. You are given a choice to select between the people according to their marital status. You can also select your audience according to their education. Now you have to tell about your campaign, budget, pricing and schedule your ad. You have to associate a campaign with the ad. It is a compulsory component of a Facebook Ad. You can change its name afterwards if you want to change it. 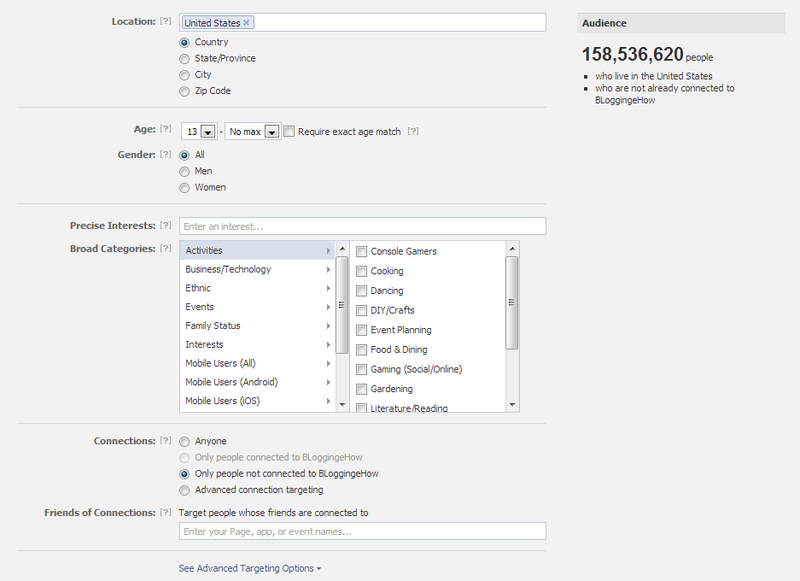 Facebook will distribute your ad budget according to the option you select. You can select the starting and ending dates of your campaign. You are again given two options to get paid. You can select any of them according to your campaign. BloggingeHow | Making Blogging Simpler: How to Create and Publish Your First Facebook Ad?